We use the quickest and most effective techniques to keep your face and body silky, touchable, and hair free. We regret that waxing cannot be performed on clients taking Accutane, Retin A, or any antibiotics due to the sensitivity of the skin. We recommend taking 2-4 ibuprofen, 30 to 60 minutes before the appointment. 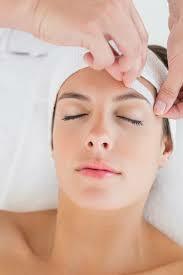 It dulls pain receptors and makes it a more pleasant experience for the client and the esthetician. Allow 7-10 days of growth before the waxing service. It should be about 1/4 to 3/8 inches long, but this can be hard to determine. Five days will not be long enough, however, if the hair is too long, it could be painful as well. Limit caffeine intake on the day of the waxing service, since it stimulates the nervous system and increases senstivity. Try to schedule appointments within the first 2 weeks of your menstrual cycle, after the last period, if possible. At this time, you are retaining the least amount of fluid, and it’s more comfortable. Do not use self-tanners, exfoliants, or moisturizers the day of your waxing. It can cause infections or irritations since the sensitive hair follicles are open after the waxing. Avoid the tanning bed as well, especially after. Never wax a new area of the body for the first time before a big event. We never know what kind of reaction there may be. Even if you have received waxing prior to, come in 2-3 days before the big event to make sure there is no reaction.